Synthetic Winch Ropes & Cables | WARN Industries | Go Prepared. The rope and fairlead are an important part of your off-road success. Having the proper rope can either get you out of trouble or make the issue worse if it breaks. All Warn rope is tested and certified for certain weights and we have the one that will work for you. Going hand in hand with that is having a proper fairlead so it can guide your line when in use. You don’t want your ride getting pulled in a wrong direction and this is why the fairlead comes in handy. Spydura® synthetic winch rope is constructed of a unique ultra high molecular weight polyethylene material and offers high abrasion resistance and tremendous tensile strength. Coated with high temperature urethane, equipped with a temperature resistant sleeve on the first layer and a ballistic nylon sliding sleeve, Spydura synthetic winch rope provides extreme protection against wear and abrasion. The unique self-tightening rope attachment designed to hold the rope secure on the winch drum makes this exclusive offering from WARN ideal for pushing the limits on the trail. Lightweight, durable, and easy-to-handle Spydura Pro rope is 38% stronger than standard Spydura, and up to twice the breaking strength of the competition. Made with a heat treated fiber that delivers maximum tensile strength, Spydura Pro is made for synthetic-compatible WARN winches up to 16,500 lbs. (7484 kg) capacity. 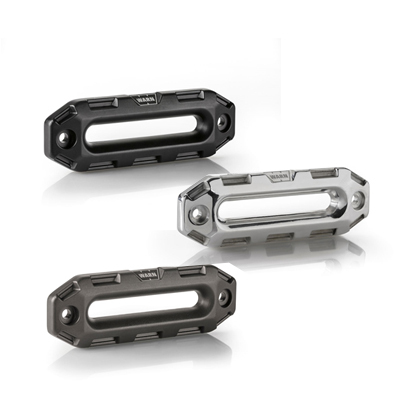 Add durability and rugged style to your WARN winch setup with new Epic and Premium fairleads. Made from forged 6061-T6 billet aluminum, these fairleads are built to last and styled to look great. WARN offers two types of hawse fairleads: black cast iron and polished aluminum. The black units are good for use with steel or synthetic, on winches with a 6,000 lb. (2722 kg) pull capacity or greater. The polished aluminum fairleads are designed to be used with synthetic rope only, and minimize the possibility of fraying. For winches over 6,000 lbs. (2722 kg) capacity (except M15 and 16.5ti). For M15 and 16.5ti winches. Roller fairlead covers are made of high strength ABS co-laminate and attach easily to a roller fairlead. Fits the Trans4mer and Jeep mounting kits.